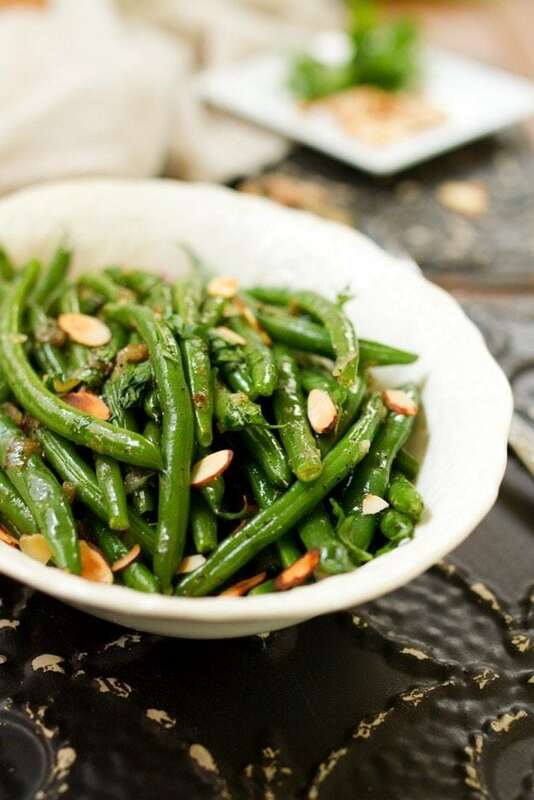 Add some green to your Thanksgiving menu with this flavorful recipe for tender crisp green beans tossed with caramelized shallots, toasted almonds and fresh parsley. Remember when I said that this week was Thanksgiving inspiration week? I wasn’t kidding!! 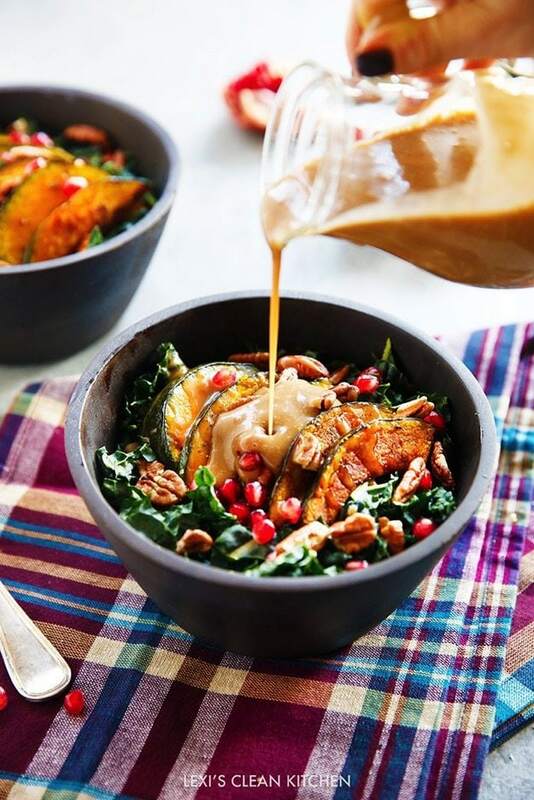 Yesterday I gave you a festive vegetarian main and today I’m teaming up with my favorite blogging ladies to bring you six healthy holiday side dishes. They’re all beautiful, tasty and loaded with nutrients! I personally want to have every single one of these side dishes at my Thanksgiving dinner. I think you’ll agree. Let’s get this side party started. 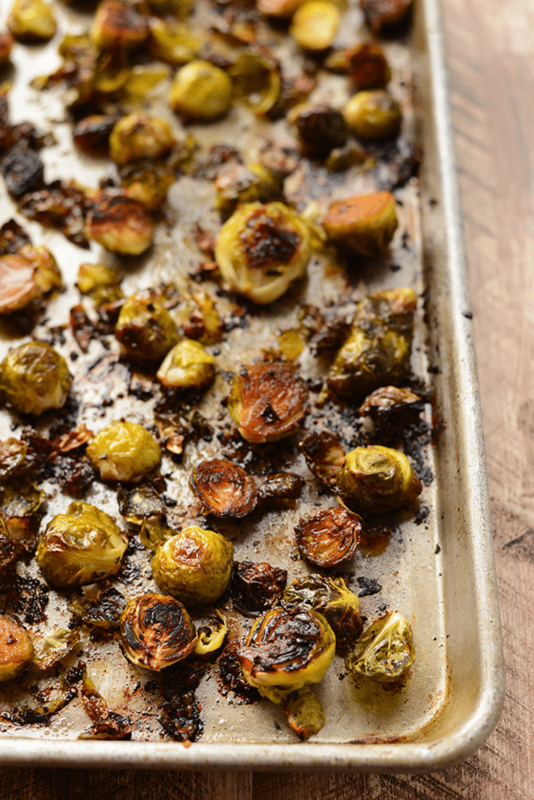 These roasted Brussels sprouts are the most delicious vegan and paleo side that everyone will gobble up! 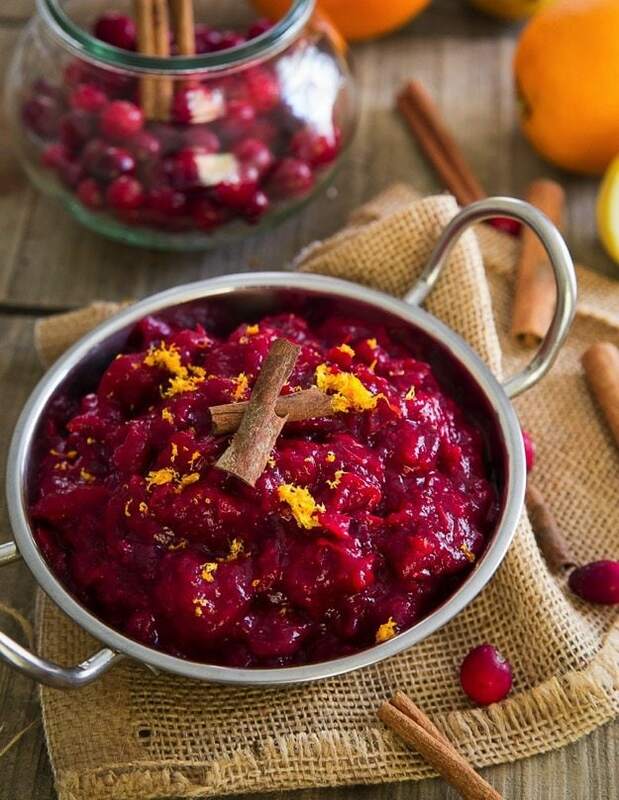 This simple cranberry sauce is made with just 5 ingredients. Make it in the slow cooker and save the stove-top space for all the other Thanksgiving sides. 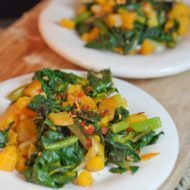 This Salad has all the ingredients you’ll want in a Fall dish! 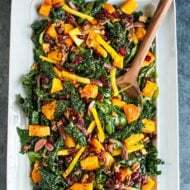 Packed with chopped kale, roasted squash, pomegranate seeds, toasted pecans and topped with a super easy and delicious maple balsamic for the absolute perfect Thanksgiving salad! 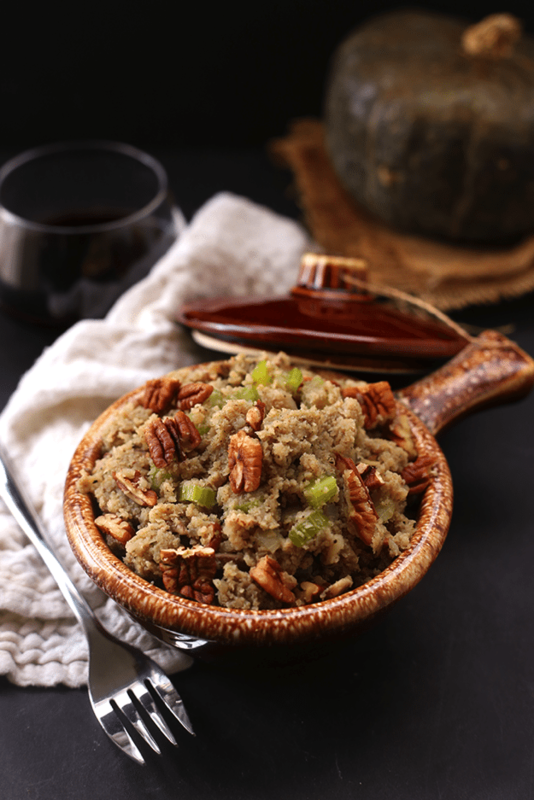 This healthy, low-carb cauliflower rice stuffing will convince your Thanksgiving guests to jump on board the cauliflower rice train, while secretly getting them to eat more veggies! Plus it’s ready in under 20 minutes. 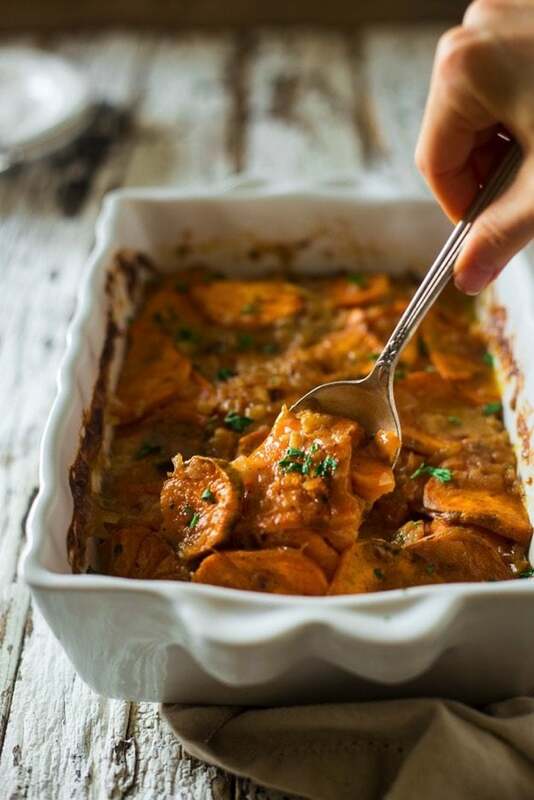 These easy scalloped sweet potatoes are SO creamy and flavorful, you’ll have a hard time believing they’re secretly healthy, paleo and vegan friendly! Last up we have my green beans with caramelized shallots and almond slices. 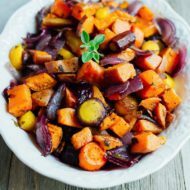 This bright side dish is so easy and incredibly flavorful. The beans are quickly cooked so they’re still crisp and fresh tasting but have a nice coating of coconut oil, a light sweetness from the caramelized shallots and a pop of flavor from the fresh parsley. 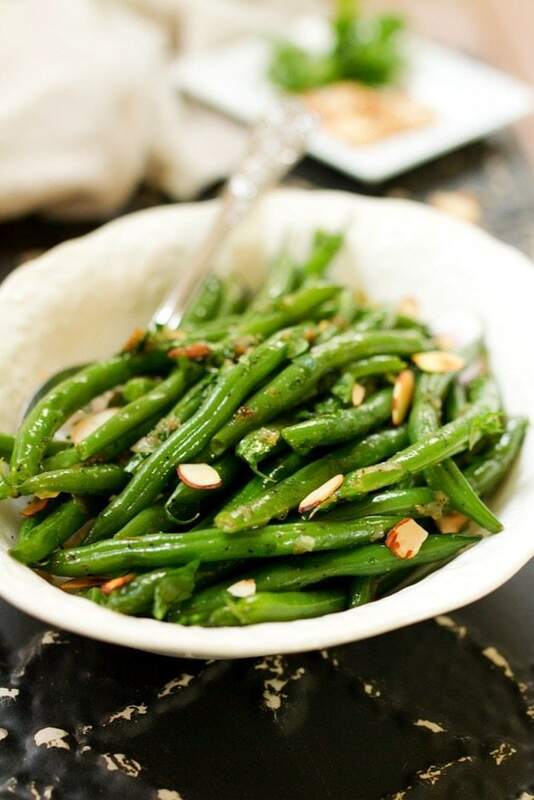 I’d take these green beans over green bean casserole any day! I honestly liked these beans so much I ate the whole pound in two days without sharing. I think Isaac may have gotten one bean, but that’s it. Oops. Guess I’ll just need to make another batch! Add a little green to your Thanksgiving menu with this flavorful recipe for tender crisp green beans tossed with caramelized shallots, toasted almonds and fresh parsley. Heat a large dry skillet over medium heat, add almond slices and cook until toasted, about 5-6 minutes or until almonds are golden. Remove almonds from skillet and set aside. In the same skillet, add coconut oil and heat over high heat until melted. Add in shallot slices, turn heat down to medium-low. Cover the skillet with a lid and cook shallots until caramelized, stirring frequently throughout the cooking process. This should take about 15 minutes and the shallots should turn golden brown in color. Meanwhile, cook the green beans by bringing a saucepan of water with a pinch of sea salt to a boil. Once water is boiling, add in green beans and cook for about 3-4 minutes or until the beans are bight green in color and tender crisp. Drain and transfer the beans into the skillet with the caramelized shallots. Toss to combine. The coconut oil and shallots will coat the beans. Add in chopped parsley and apple cider vinegar. Season with sea salt and pepper. Heat for another 3-4 minutes or until beans are warm. 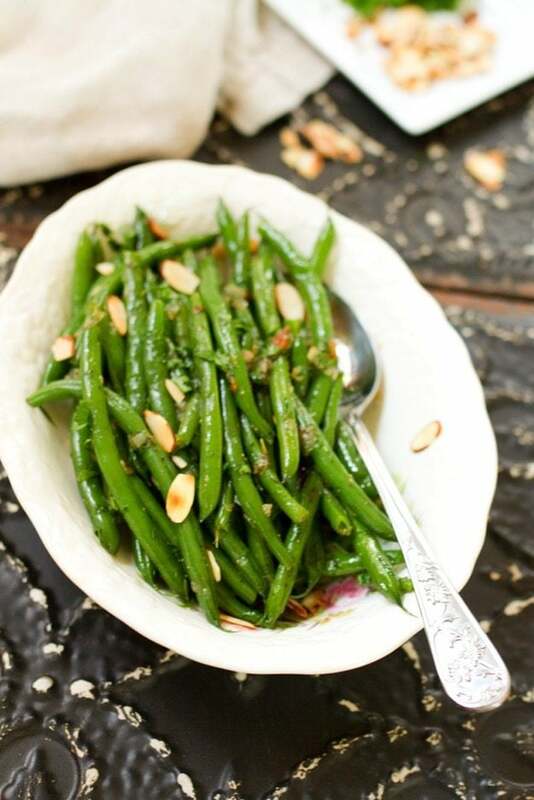 Transfer beans to a large dish or platter, top with toasted almonds and serve. What’s your favorite Thanksgiving side? 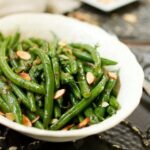 Green beans with almonds are one of my favorite combos ever! And those shallots are just taking these green beans to a whole new level of yum! Pinned! Those green beans look so great!I used to think I hated green beans because we only ever had the canned ones growing up. Now that I’ve had fresh, I love them! Right? Fresh green beans are sooooo much better. I love the crispiness. Thanks Nicole. The Brussels sprouts are at the top of my list too. The beans looks so good! I have never tried combing green beens and almonds but it sounds really good so I am definetely going to try it! 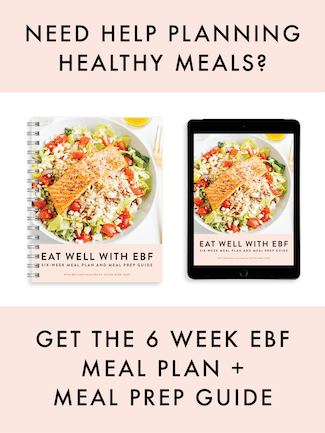 You gotta try it — the green bean and almond combo is great! Mmm, I’ve got a heap of green beans that I’ve been avoiding due to lack of creativity. These look tasty! I’m going to a early Friendsgiving and I’m supposed to bring the green beans. These look delicious. Any suggestions about how I can cook them ahead and reheat them there without losing flavor and crispness? I would just cook them as the recipe suggests and then reheat them in a skillet for a few minutes right before serving. Have a great Friendsgiving!